From simple Sevens to extreme Superlight R300s and classy Caterham 21s, whatever Caterham you own, Adrian Flux can insure it. Whether you bought your Caterham as a project and long-term hobby, simply just to have fun driving or for days out on the track we can use all of our experience to provide you the exact insurance that you need, at a price you'll like. Plus, as car enthusiasts ourselves, we know exactly what you look for in a car insurance policy, and we cater our cover and service to suit your exact needs. Founded over 40 years ago to provide specialist car insurance for people who just couldn't get insured elsewhere, Adrian Flux has grown to be the UK's largest specialist insurer. 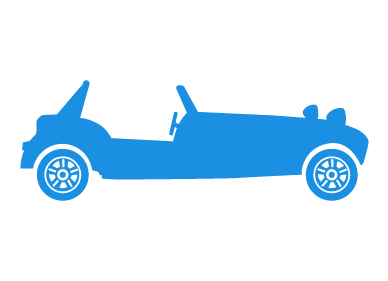 With decades of experience finding insurance for people with unusual or unique cars, we are perfectly positioned to help you get car insurance for your Caterham. On top of our owners club discounts we have a massive range of other Caterham driver discounts available, for everything from experienced drivers to increased security measures. We also provide a great selection of optional add-ons, from keycare to gadget cover, getting you the protection you need whilst also helping you to manage your premiums. Our cheapest rates are available only over the phone, so why not get in touch now to see how much you could save. Complete a callback form online to hear from one of our trained staff today, click the quote button below to get a Caterham car insurance quote right now or call 0800 369 8590 to speak to one of our trained experts right away.